Let’s start with the wage. The Fair Labor Standards Act (FLSA), which we have described elsewhere on Suits by Suits, requires employers to pay employees the minimum wage for all hours worked, and to pay one and one-half times the regular rate for all hours worked in a week in excess of 40 hours. Not all employers are subject to the FLSA, nor are all employees protected by it. For the FLSA to apply, there must be either “enterprise coverage” or “individual coverage.” Enterprise coverage means that the employer has more than one employee engaged in interstate commerce, and has annual gross sales totaling at least $500,000. Individual coverage means that the employee has been engaged in interstate commerce or the production of goods for interstate commerce. The FLSA also exempts certain categories of employees, such as executive, administrative and professional employees. However, none of these exemptions applies unless the employee is compensated $455 per week or more. All of this is good news for Bob. True, he may not be able to invoke enterprise coverage. Even if Scrooge’s annual gross sales are $500,000 or more, Bob is apparently the only employee of Scrooge’s business. So, it could not be said that the business has more than one employee engaged in interstate commerce. However, Bob should be able to invoke individual coverage, so long as, in doing his work, he is engaged in interstate commerce, which includes regularly handling interstate mail and telephone calls, and engaging in banking or credit card transactions. The sole clerk of a stock brokerage business would have to be doing these things. Bob would not be exempt from the FLSA’s protections, either. Even if Scrooge contended that Bob is an administrative employee, Bob’s 15 schillings per week (at most $200 per week in today’s dollars) are well below the $455 minimum for that exemption to apply. 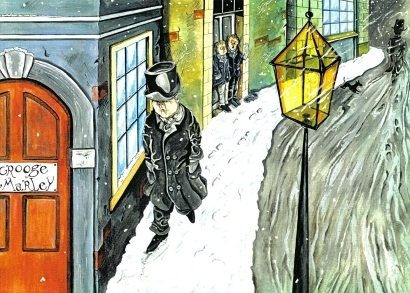 Scrooge violated the FLSA by failing to pay Bob the minimum wage for all hours worked and by failing to pay overtime. Bob works six days a week, for at least eight hours a day. Yes, Scrooge reluctantly gives Bob Christmas day off, but, for our purposes, we will assume no days off but Sundays. For the first 40 hours of the week, Bob is entitled to at least the federal minimum wage of $7.25 per hour, or $290. For the eight overtime hours, he is entitled to one and-a-half times that rate, or $87. That means that Scrooge is short-changing Bob $177 per week. If he sues Scrooge, Bob could be awarded that amount as back wages for all weeks that he worked for Scrooge going back two years (or three years if Scrooge acted willfully), most likely times two as liquidated damages. He would also be entitled to a court order directing Scrooge to comply with the FLSA in paying Bob for his work going forward. State wage and hour laws may provide even further relief for Bob. Of course, Bob does not live today in the U.S.A. Lucky for him that the ghosts of Christmas inspire Scrooge to raise Bob’s salary.